Enjoy plenty of space and resource savings. This Amana 18.5 cu. ft. Bottom-Freezer Refrigerator helps you conserve energy and save money on your utility bills. It features a reversible-swing door and fits what you bring home from the market with versatile storage options, like two humidity-controlled GardenFresh crisper drawers, gallon door storage and two full-width glass shelves. Temp Assure freshness controls put consistent temperatures right at your fingertips, while essential design means that the fresh food you use most is right at eye level for easy access. 1 Year Limited Parts & Labour. This 29-inch Wide Amana. bottom-freezer refrigerator keeps fruits and veggies in sight and top of mind with Humidity-Controlled Garden Fresh Crisper Bins. Adjustable Door Bins can be moved up or down for easy access. Plus, use Gallon Door Storage Bins to help fit everything from milk jugs to juice cartons, or even a six pack of soda. Your GE 24.9 cu. ft. ENERGY STAR Bottom Freezer Refrigerator in Stainless has doors with hidden hinges that lets you step up to rounded doors and the clean look of concealed hinges. The Factory-installed icemaker comes ready to automatically create ice. A sliding snack drawer conveniently stores favorite foods and allows for quick, easy access, while Adjustable gallon door bins offer ideal space for storing gallon containers in the door. This GE bottom freezer refrigerator is designed with fresh food compartment in the upper portion of the refrigerator with freezer in the lower portion. With Frost Guard technology, defrosting occurs only as needed, therefore reducing freezer burn (in the freezer compartment). Features integrated controls and interior LED lighting. 18 cu. ft. Refrigerator with Bottom Mount Freezer in White Enjoy plenty of space and resource savings. This Amana 18.5 cu. ft. Bottom-Freezer Refrigerator helps you conserve energy and save money on your utility bills. It features a reversible-swing door and fits what you bring home from the market with versatile storage options, like two humidity-controlled GardenFresh crisper drawers, gallon door storage and two full-width glass shelves. Temp Assure freshness controls put consistent temperatures right at your fingertips, while essential design means that the fresh food you use most is right at eye level for easy access. 18 cu. 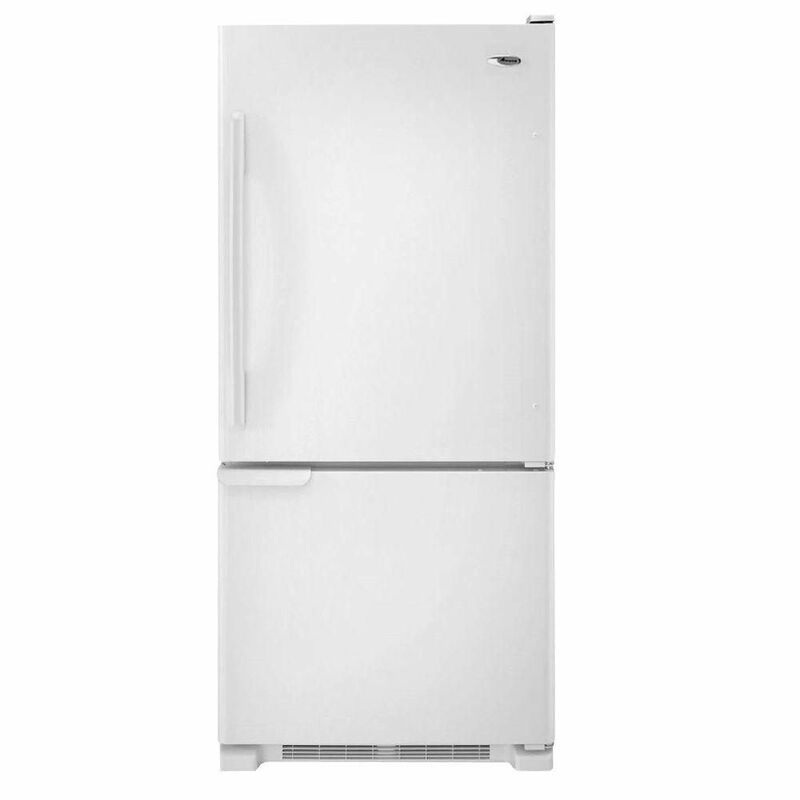 ft. Refrigerator with Bottom Mount Freezer in White is rated 4.3 out of 5 by 147. Rated 5 out of 5 by Cindy from I am very happy with the Amana bottom freezer refrigerator. It was a good price. The freezer i... I am very happy with the Amana bottom freezer refrigerator. It was a good price. The freezer is real easy to pull out and access. It fits my needs. Rated 5 out of 5 by MFM from This is the perfect “garage refrigerator “. ... This is the perfect “garage refrigerator “. Rated 5 out of 5 by Anonymous from We purchased this because of limited kitchen space but it... We purchased this because of limited kitchen space but it still has more than enough internal storage space. I switched the doors and the hardware and overall construction of the unit are very high quality. Rated 1 out of 5 by Dissatisfied from I've had this refrigerator for less than a year and a half and it is being repaired for the SECON... I've had this refrigerator for less than a year and a half and it is being repaired for the SECOND time. The first time it was under warranty and Amana's technician said he had to replace the computer board on several of these models in a few days so they must have gotten a bad batch. It's just not worth it at any price. Buy another brand! Rated 5 out of 5 by Janet from We just love this frig! My girls, ages 8 and... We just love this frig! My girls, ages 8 and 10, love the freezer on the bottom and that they can still reach what they want in the frig section, with all the storage in the door. It's just the right size for us, not too big, and runs quietly. Rated 4 out of 5 by Dottie from I am satisfied with the refrigerator with one exception. ... I am satisfied with the refrigerator with one exception. The top tray in the freezer does not pull out and it is very inconvenient to get anything that is on that tray. Otherwise it meets my needs. Are the door bins adjustable? On another vendor's website for this fridge (same model #) the door bins listed as not being adjustable, but there aren't any pictures of the fridge interior. They appear to be adjustable in the Home Depot pictures. Are they? Do doors opening from right as well Is it changeable ?